Falcon Lake has some fantastic angling opportunities, from your boat or through the ice. The Falcon Lake Winter Fish-Off gives anglers the chance to catch a huge fish for some huge cash and prizes. The pike that won the 2011 Falcon Lake Winter Fish-Off. • A Canada One travel trip for two plus $1,000 travel credit (2nd place). • Ultimate ice fishing package that includes a Frabill Ambush three man flip over ice shelter, a Vexilar FL-22HD Pro View Ultra Pack Flasher, an ION Electric Power Auger, and much more (3rd place). • A 60″ 3D Samsung Smart Plasma 1080P HDTV (4th Place). • Shimano rods and reel package (8th place). • Crowduck Lake Camp fishing trip (13th, 23rd, 33rd,and 43rd). • Guided musky fishing trips, tackle, power augers, and much more! Check out the full list of prizes here. 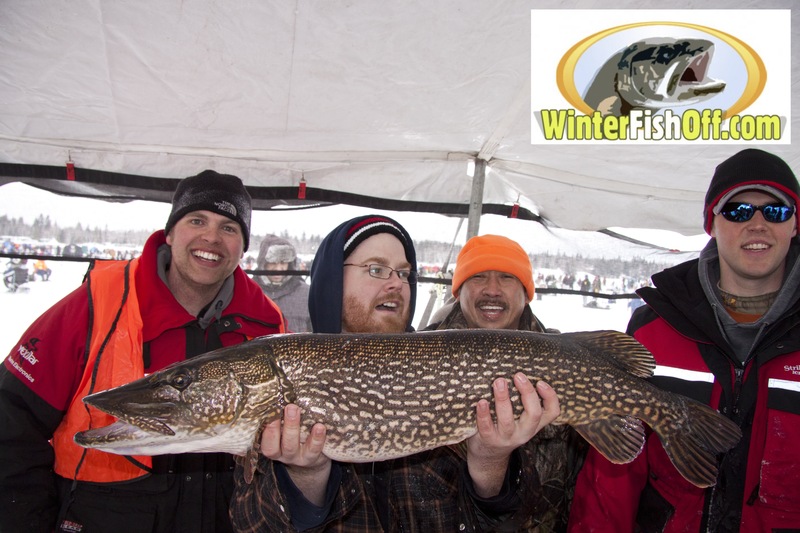 The Falcon Lake Winter Fish-Off has many great prizes including $10,000 cash for first place! Back by popular demand is the $50,000 Hidden Weight Contest. Participants that land the first 120 fish on the ice will automatically be entered into the contest. If your fish matches the hidden weight, you will win $50,000! If no one matches the hidden weights, the participants with the closest weight will still win great prizes courtesy of Frabill and Eskimo. There will be hot food and drinks all day provided by Danny’s Whole Hog and all prizes will be awarded at the Whiteshell Community Club at 3:00 pm. This year the fish-off will be supporting the St. Amant autism program. One dollar from every ticket sold and all proceeds from the on-ice bait sales will be donated. Adult tickets are $50 if you purchase them before March 5th, and after that they are $70 each. Second Hole and kids are just $30. You can purchase tickets at 12 ticket vendors across Manitoba and Northwestern Ontario, online at www.winterfishoff.com, or over the phone at toll-free 1-866-676-FISH (3474). This entry was tagged All Species, Bait, Danny's Whole Hog, experience the whiteshell, Falcon Lake, fishing, Fishing Tournament, Ice Fishing, Lure, Money, Northern pike, Perch, Prizes, Rod, St Amant, Walleye, Whiteshell Community CLub, whiteshell provincial park. Bookmark the permalink.